This story arc, especially in this issue, feels more like a Hal Jordan and the Green Lantern Corps interlude than a Superman story but it is still appreciated as one. My biggest takeaway from this issue is the look into Superman’s fears. I love that this title really shows that Superman isn’t fearless, especially when it comes to the one’s he loves. This isn’t the first time either as earlier in the run, Clark talks with Jon about how he also is afraid of things because it keeps him vigilant. It shows that he isn’t just a surface level Boy Scout-- he has depth to him as a character and is more human than we all realize. I think sometimes readers can forget this about Supes and issues like this is a great reminder of his fears. He fears that he can’t save everyone, fears he will lose his family, or worse, hurt them. He even fears that his son will turn against him because he can’t always be there for him, the fear that his job as Superman will keep him from watching his son grow up. 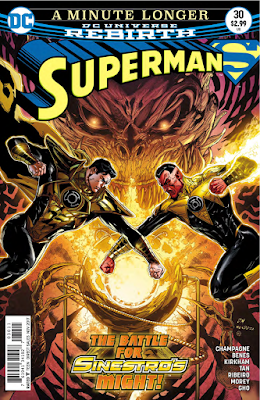 Sinestro visualizing his fears to us is only 3 pages but it’s a powerful 3 pages and the true meaning of a picture has a thousand words. I’ve been wanting to read GLC but haven’t got around to catching up to it. 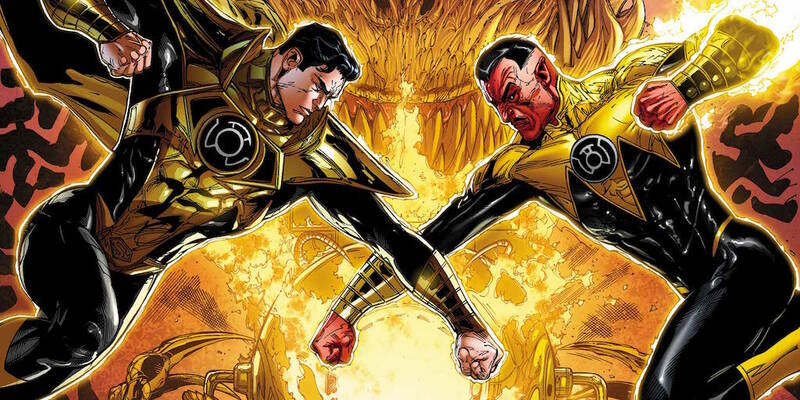 The plugs in here are great since it guides me to what I need to read to fully understand these 2 issues about what’s going on with Sinestro and where to read next to see what happens to Parallax. I do still feel this should have been in the GLC run as 2 interludes for an annual or something and feature Hal with Clark. However, I still enjoy it as a Superman story and it was a great opportunity to explore his character further. The art in this is fantastic too-- it’s a perfect fit for Superman that has a classic yet modern feel to him. Definitely tops off the issue for me. 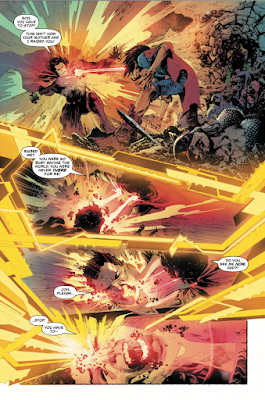 Superman #30 is a great issue and while I think it would have benefitted from it being in the GLC run that featured Superman teaming up with Hal, it’s still much appreciated as a Superman story. We get a great look into Superman’s psyche while having a fun adventure with some great art to boot.